6 inch hard or soft flour tortilla with your choice of filling Topped with lettuce, tomatoes, cheese and taco relish. Served with side of beans or rice. Grandma Lupe’s famous sweet crispy flour shells topped with your choice of filling, blended cheeses, sliced jalapeño and then baked to perfection. All include sour cream and guacamole. 6 inch flour tortilla filled with your choice of filling then rolled and topped with enchilada sauce and baked with blended cheeses to a golden brown. Served with choice of beans or rice. 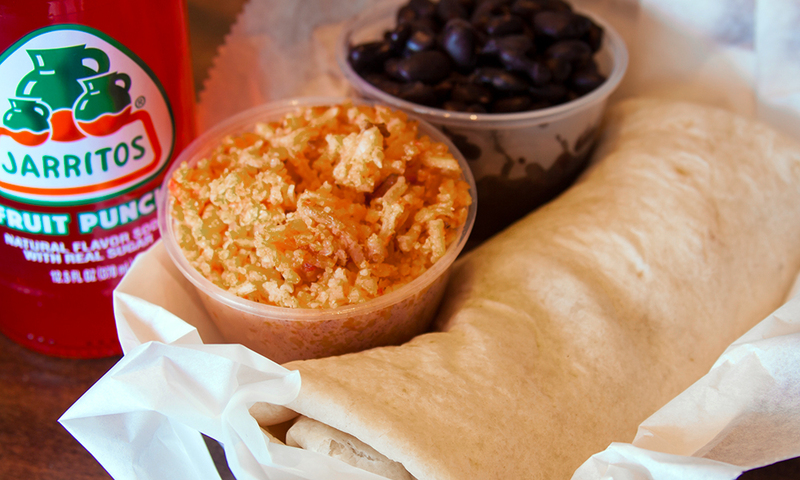 Our 12 inch flour tortilla filled and rolled with your choice of filling along with guacamole, pico de gallo, cheese & your choice of beans and rice. Spicy Pork $7.95 Burrito smothered with enchilada sauce & cheese baked on top.